You don’t expect a sense of humor in a book of this sort, but its there, from the introduction through the final chapter. A subtle sprinkling of levity, a small gift for the reader. It’s also a good book, one I recommend. Hypnosis has become far more common – and popular – in the last decade. There are still some misconceptions about it, but the benefits are clear to anyone who looks. Hypnosis is basically a very focused state of attention that creates a state of deep relaxation while quieting the conscious mind. In this attentive, relaxed state, suggestions made are likely to be acted upon. Personally, I’ve been using hypnosis for pain management since a major surgery a few months ago. Narcotics worked great for awhile, but when I went off of them, the pain was literally unbearable. OTC drugs made a dent but I had to take maximum dosages to just barely get by, and the toxicities were becoming to great for my body to bear. So I went to see a clinical hypnotist. After one session my pain and discomfort were halved. At the next session he made a sound file for me to listen to at home. Within three sessions of listening my pain and discomfort went away. A subsequent surgery had me going back to listen to the file a few times, and I didn’t need anything after the initial few days of healing. 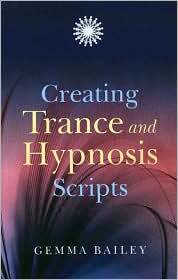 Creating Trance and Hypnosis Scripts is a practical and well-thought-out collection of scripts. Embedded commands are specifically noted so you can deepen your voice or make it slightly louder and suggestions are made using positive language. The scripts are varied in their topics and noted as being for amateur or professional use. The last chapter gives clear direction for creating your own scripts.